Ever since Joan Didion called New York City “an infinitely romantic notion, the mysterious nexus of all love and money and power, the shining and perishable dream itself,” aspiring writers have been longing to move to New York, and almost as many to leave it. It’s a part of the initiation process as a writer–drop everything, move across country, and join the masses scrambling for the same acute, near unattainable dream. And for as long as writers come to New York, love New York, and likely burn out and leave New York, there will be essays covering this very topic (we’re writers, you see, we can’t simply experience something, we have to write about it). I’ve been preparing my own goodbye to all that since January. One terrible day at the center of the polar vortex, I hid away in Barnes & Noble, killing time until I said goodbye to a very nice boy I knew I would leave behind for my inevitable return home. 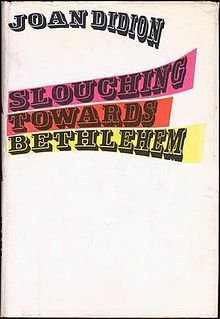 I had been looking for signs, so I forced fate on myself and picked up Didion’s iconic essay collection Slouching Towards Bethlehem. “Goodbye to all That” appeared in the 1968 collection; Didion was 29 and returning home to the West Coast. Every writer’s experience is different. Every New York transplant shines or diminishes in different ways. When I moved to New York on August 31st of 2013, I didn’t think I would want my return so soon. Of course, nobody plans for loss, so I didn’t see it coming that my brother would die less than two months after I finally made the cross-country move I had been dreaming of since seventeen and always putting off for fear of leaving my family behind. Call that the universe having the last laugh. The horrible winter here didn’t help, nor did the suffocating feeling of living in this crowded city and feeling like there was never quiet enough to grieve. Come January, I had already made up my mind to leave. I told my friends and family, made a list of all the companies in Seattle I could apply to, and started obsessing over rentals on Craigslist. I would leave in the spring, flee. No, I would wait until the summer, show I hadn’t given up so easily. No, I would survive the whole summer and move at the end when my apartment’s lease ended–I had said I would give New York a year, after all. I went to work everyday knowing I had a clock ticking down the days. I started making connections in Seattle, began reaching out to those already in place. This was it, the great return home (the return I had been certain wouldn’t happen for years, not until after I had cut my teeth on the East Coast publishing world). I became defensive, told everyone that it was my decision to go home. How could they tell me how to react to my family’s loss? You lose your brother and then tell me what it feels like. I take back everything I said; don’t trust me, I’m grieving. Somewhere, there was an unexpected light. On a whim, I applied to a job in publishing. Surprisingly, I was called in for an interview, and then a second. They called my references; I called my parents. Within a week, I had been hired. I start today–after seven months, after the worst tragedy I’ve ever endured, after giving up, I find myself here. I called my mom immediately after learning I had been hired because she was the one person I absolutely needed to be okay with my decision to stay. I explained it to her like this: since my brother’s death, I have experienced one consistent emotion (above the anger and confusion and guilt), sadness. When I interviewed and was hired for the job, I felt happy. For the first time, I felt an emotion that outweighed sadness. This isn’t about goodbye after all. Someday, sure, though I can’t plan when. If I’ve learned anything since I moved here it’s that the unpredictability is part of the experience. I realize now that I came to New York to leave it; I had goodbye in me from the start. This is a do-over. Hello, New York, I’m here, will you have me?